What Cereals are Recommended for People With Diabetes? Elizabeth DiDio began her career in 1991. She held research positions at the University of California, Davis, Lawrence Berkeley Laboratory, and Kaiser Permanente while pursuing her science degree. She has written for the "UC AgHealth News" and co-authored articles published in the "Journal of Nutrition" and other scientific publications. 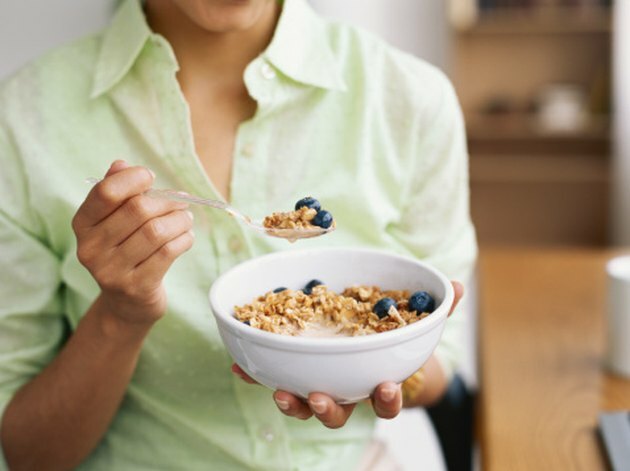 The American Diabetes Association recommends that people with diabetes choose whole-grain, high-fiber and low-sugar cereals. Be careful, however, when choosing “whole-grain cereals.” Many manufacturers know that consumers are looking for whole-grain products and they may advertise products as containing whole grains when there's very little whole grain in them. If the source of whole grain is not listed as the first ingredient, then it probably contains very little. Choose whole-grain ingredients that appear first on the food label. Brown rice, whole oats, whole rye, whole wheat, wild rice, bulgur, triticale, millet, quinoa and sorghum are examples of types of whole grains in cereals. The first ingredient in Post Grape-Nuts cereal is whole-grain wheat flour. The first ingredient in Post Shredded Wheat cereal is whole wheat, and for the Weetabix biscuit cereal the first ingredient is whole wheat. A number of other brands such as Barbara’s, Cascadian Farms, Bob’s Red Mill, Kashi and Nature’s Path also make whole-grain cereals. Eating foods high in fiber helps to regulate your blood sugar levels by slowing down the digestive process. Fiber is found in whole grains. The American Diabetes Association recommends choosing cereals that contain 3 grams or more of fiber per serving. Post Shredded Wheat contains 6 grams of dietary fiber per serving. Post Grape-Nuts contains 7 grams of dietary fiber per serving, and Weetabix contains 4 grams of dietary fiber per serving. Stay away from whole-grain cereals with added sugars. Choose cereals with a very low amount of sugar -- less than 6 g, recommends the American Diabetes Association. Post Shredded Wheat contains 0 g of sugar per serving. Post Grape-Nuts contains 5 g of sugar per serving, and Weetabix contains 2 g of sugar per serving. Whole-grain breakfast cereals will usually contain the lowest amounts of sugar or none at all. Is 10 Grams of Sugar in Cereal a Lot?